"Manual labor data processing is reduced, thereby reducing errors. Information can be passed quickly, and it can be transferred directly to the customers"
To ensure that traffic and safety needs are met, Liikennevirasto keeps track of the condition of the rolling stock on Finnish rails through a network of detectors installed along the track. Full exploitation of the data registered by the fault-detection system would enable preventive maintenance for improved safety of railway operations. The objective was to combine information the network detection systems with individual wagons (typically hot axle boxe detection (HABD) systems and wheel impact load detection (WILD) systems). When trains arrive at shunting yard, the train operator needs to assign different maintenance and service operations to single wagons. Especially at busy hours it can be time consuming to check from manual listings which wagons need which operations. The railway network’s maximum axle weight is 25 tons, most lines enabling 22,5 tons. The speed limit for passenger trains is 220 km/h and 120 km/h for freight trains. And as all the wagons are mostly used in harsh conditions, the solution needed to be very durable and heat resistant. Additionally the system may not rely on anything visual that might get dirty or might be typed into a system wrong. After extensive testing together with Liikennevirasto as well as VR, GEN2 UHF RFID technology was proven the correct technology to perform the task of wagon identification. The reliable and rugged Vilant Railroad Reader units are utilised to detect individual wagons. For Liikennevirasto it was important to take full advantage of the network of detectors already in place and to link the registered data with the affected rolling stock. The solution would also have to enable interoperability to allow information to be easily analyzed and shared with train operators such as VR Group who, in turn, would be able to locate wagons and perform preventive maintenance and repairs where needed. Recently the Shunting Yard solution for VR Group was also updated to carry a wider range of applications. Full exploitation of the data registered by the fault-detection system that enables preventive maintenance for improved safety of railway operations. For example, it links data accurately to an over heated axle bearing, the wagon and the train it belongs to as the phenomena happens. Therefore, it can be replaced before it breaks. Enables database formation and sharing of data with operators who own the trains. Hence, providing better service to operators. For example, it can inform VR Group about the exact location and arrival time of their trains. The identification of all wagons and locomotives with RFID gives a complete and up-to-date inventory at all times. 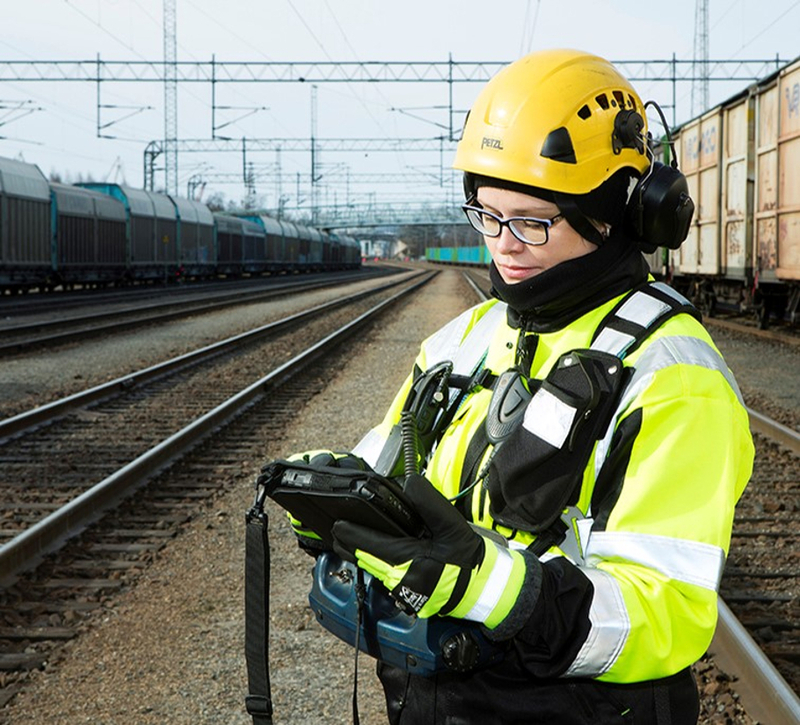 According to Mikko Särkkä, Head of IT Logistics at VR Transpoint, “Real-time monitoring and traceability of location and movement saves time and simplifies asset pool management, particularly in the rail yards.” The information exchange from the readers (handheld or fixed) to VR Transpoint’s computer systems is made automatically and therefore, the potential for errors from manual work is reduced. More efficient asset pool administration can increase the utilization of wagons. As a result, also increase customer service performance. Previously, ground control and the control group passed on information about current work tasks and the tasks performed in fax receipts and a telephone. Now, there is an automated communication system. In addition, work instructions are also digitally delivered through the handheld devices for optimal timing. Added value business applications: For VR Transpoint this is however just the start as the new logistics system gives rise for several additional beneficial applications. Some of these applications include tracking of assets; integration with weighing of wagons; defect marking and tracking; as well as, several cargo customer services leading to a new level of services to VR Transpoint customers. VR Transpoint is already launching a few pilot projects where RFID system helps deliver information directly to VR Transpoint customers’ information systems in real time. Finland has 5.919 kilometers of railways in use. The management, development and maintenance of the railway network is handled by the Finnish Transport Agency (Liikennevirasto). The operator of most freight and in practise all passenger trains is VR Group. VR Group offers high quality and environmentally friendly travel, logistics and infrastructure engineering services. VR Group employs 7500 professionals and had a turnover of 1.186,7 million euros in 2016.